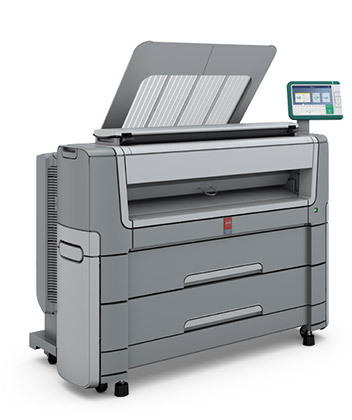 Take control of document costs and project workflows with the instant productivity of the Océ PlotWave® 500 large format printer, copier, and scanner. Printing and collating documents inefficiently can be costly and eat up the valuable time of knowledge workers. The Océ PlotWave 500 printing system is built for fast production — at an impressive ten D-size/A1 drawings per minute and up to four rolls of media. That’s up to 600 prints per hour! It starts printing from sleep mode in less than 17 seconds thanks to Océ Radiant Fusing technology, compared to a slow start-up of four minutes for some conventional printers. That can easily save you an hour or more just in printing delays. And while printing, there is no need to wait to scan. You can print and scan concurrently. Just like the Océ PlotWave 340/360 printing system, walk-up users interact with this printer like a smartphone/tablet thanks to the 10.4″ color LCD touchscreen interface with multi-touch. That means CAD professionals are already familiar with the Océ ClearConnect user interface from the onset. And true to its name, Océ ClearConnect makes the right connections to get the job done. Print on the way to your next meeting or from a job site — to keep work moving even when you can’t get to the printer. Don't buy Océ Plotwave 500 without contacting Napco. Call us today at 1-866-752-6766.